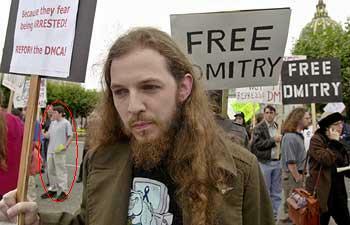 You can see me in the background of this shot taken by The Economist on July 30, 2001. 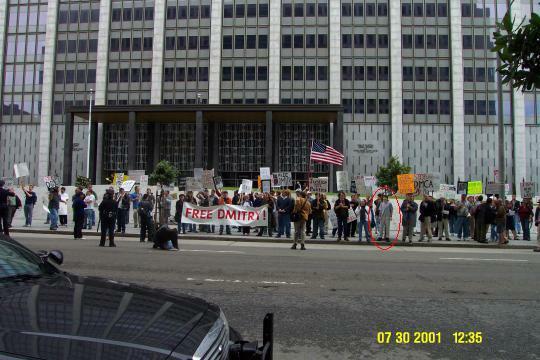 On that day, over 150 protestors, organized by the EFF, gathered in San Francisco to free Dmitry Sklyarov, who the government had imprisoned for allegedly violating the DMCA. That's when I became a copyfighter. When I read about Dmitry and saw this picture of him and his family, I had a gut level reaction—instinctively, his imprisonment was insanely wrong. I didn't think twice about joining the protest. There are many issues to be concerned about in this world, but I don't generally have that kind of automatic response; I was not an 18-year-old causehead. Why did this issue strike such a chord then, and why does it continue to captivate me today? My brother and mother played Space Quest with me and taught me a little BASIC. I was raised on BBSes, Mosaic, IRC, and the like. The Internet provided a technological playground and most importantly a revolutionary means to interact and connect with others. As I was uprooted from California to New Zealand and New York, I formed meaningful relationships online. I fondly remember visiting my rotisserie sports league-mates at the Department of Education in DC. Those leagues also spurred me to start writing and publishing and inspires my own dorky version of remix culture [WMV] today. My interest in digital media grew beyond the sheer excitement and profound cool factor I felt when I got a Rio PMP 300 for my 16th birthday. My concern with copyright developed over the next two years as I tried to puzzle out MP3s, Napster, Gnutella, and the DeCSS case in articles for my school newspaper. Increasingly, copyright directly impacted ordinary people, and putting Dmitry's face on the damage being done made this even clearer. What's more, Dmitry's imprisonment demonstrated that you cannot simply hide in a cyberutopian dream. You are in meatspace, so are agents of control, and they can put you in a real prison. Another e-petition wouldn't stop those constraining our cyberfreedoms. The copyfight has to happen outside, in the streets. My amazement seeing everyone there who shared these concerns has stuck with me—a crowd gathered just to fight against an obscure copyright law. I felt empowered and like I belonged. And so the following summer I interned at the EFF. On the wall above my desk happened to be a shot like this one, a reminder of that inspirational moment.